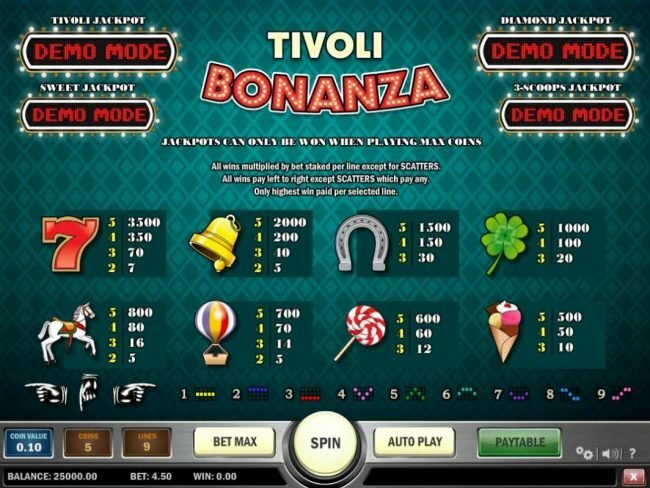 Tivoli Bonanza slot machine using the circus carnival theme with 9 lines and 5 reels from Play N Go developers. 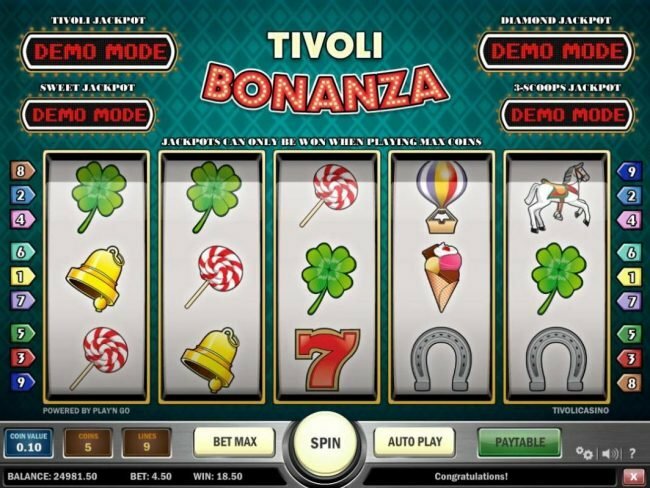 Tivoli Bonanza Slots has not been reviewed yet, be the first to rate this slot. 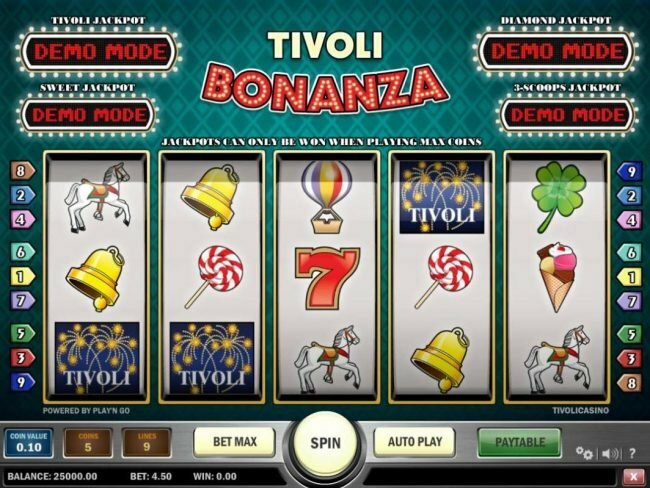 When creating a review for a new Slot machine such as Tivoli Bonanza, we have to consider there are many aspects we have to record. Mainly we point out that there are 9 pay-lines along with 5 game reels. Slot icons including Tivoli logo, lucky red seven, bell, horseshoe and shamrock really brings out the main circus carnival theme. Incorporating carousel horse, balloon, lollipop and ice cream cone we give this Play N Go created game 5 out of five for putting this together. Playing Tivoli Bonanza you have the option of playing for as little as just $0.10 on a spin. Going further you also can bet on all 9 lines to place a bet to the largest of $4.5. Scatter symbols used in Tivoli Bonanza are not ordinary ones, these diamonds are not required to appear on the same payline to win. Along with a lot of other games having more than two scatters usually starts a bonus feature. I recommend other online Slots like 7 Sins as it has 9 lines as well, some others including Mr. Toad and Oily Business are fun as well. As a lot of Play N Go slot machines like Tivoli Bonanza play the same so play some others as well. 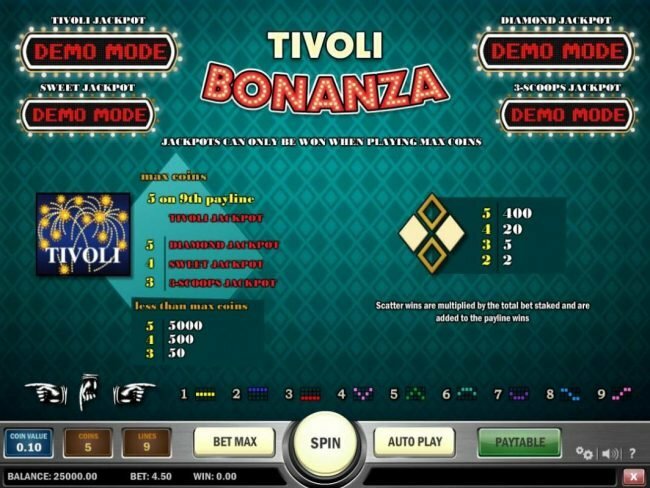 As with other 5 reel online slots, the Tivoli Bonanza slot is neat to play. The Play N Go designers went over the top to make a game this good slot to review. With icons like Tivoli logo, lucky red seven, bell, horseshoe and shamrock you can easily find yourself in the circus carnival world. In closing we think Tivoli Bonanza remains an entertaining slot with ok wins and graphics. Playing Tivoli Bonanza gives you a powerful way to score enormous amounts of cash, to do this get a slot bonus feature win. Here is info on the Bonuses you are able to score. I love the Tivoli Bonanza 3-Scoops Jackpot and the pay outs it brings. This starts once you get three Tivoli symbols on any active line while playing max coins. When you get four Tivoli symbols on any active line while playing max coins the Bonus game begins. This Sweet Jackpot offers a lot of large rewards. I love the Tivoli Bonanza Diamond Jackpot as well as the wins it is capable of! This starts once you get five Tivoli symbols on any line 1 through 8 while playing max coins. I really enjoy the Tivoli Bonanza Tivoli Jackpot and the fun it is capable of. By getting five Tivoli symbols on line 9 while playing max coins this feature will start. I will give Tivoli Bonanza 4 of 5 stars on the features. you can be distracted from the game play.